This page is for photographs of wildlife I’ve seen at Marsh Flatts Farm. 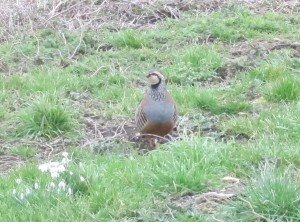 There’s one Red-Legged Partridge who thinks he owns the place and seems to like perching on the highest points of the derelict outbuildings and announcing his presence. RSPB information page is here. 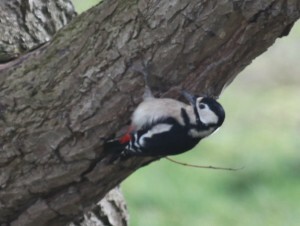 This woodpecker is only an occasional visitor – once every few months or so – but the distinctive drumming sound gives it away. RSPB information page is here. 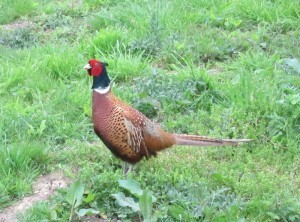 This pheasant also thinks he owns the place. RSPB information page is here. As of August 2015 he’s often accompanied by a female. 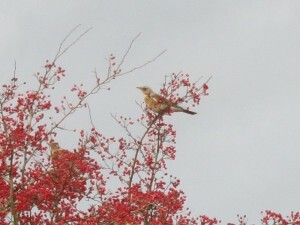 Spotted a flock of Fieldfares tucking into the bumper crop of Hawthorn berries in mid November. RSPB information page is here. The Wildlife by Marsh Flatts Farm Self Build Diary is licensed under a Creative Commons Attribution-ShareAlike 4.0 International License. Hi Ron. Thanks for your comment. I know there were some members of the HOLMES family who worked at the farm in the 1800s (there’s a James HOLMES who has a gravestone in St Peter’s Churchyard and who died aged 87 in 1920). Purely by chance I happened to engage Gordon Holmes of Trent & Derwent Electrical Services to do some work at the farm and he mentioned some of his family had worked there years ago.